This morning I felt the urge to drink something healthy. Smoothies are a great way to accomplish that. Just fill the blender with healthy goods, blend and voilà there is your health shot! I just filled the blender with things I had at home and it turned out pretty tasty! 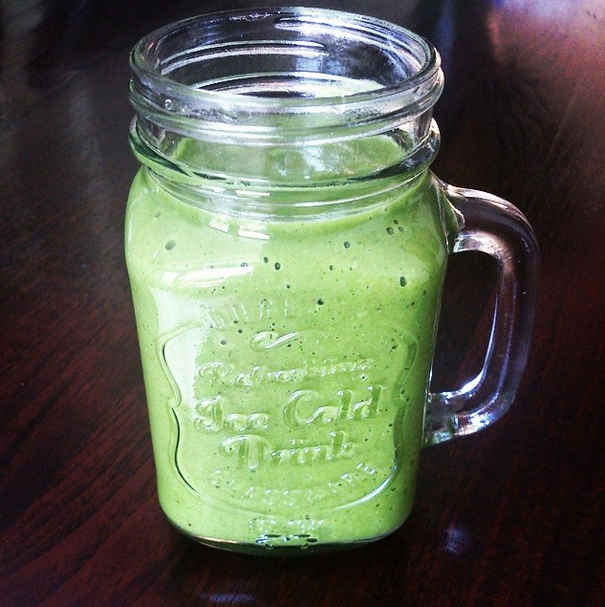 Raw spinach just gives the smoothie such a beautiful, green colour and it is super healthy as well. I bet all the vitamins are having a party in my tummy right now! Just simply mix all the ingredients together and there you have an amazing drink that will help you get through the day. I always try to eat a lot of fruit and veggies and smoothies are a great way to do that. What a perfect start on a Sunday! Let me know what your favourite smoothie is!